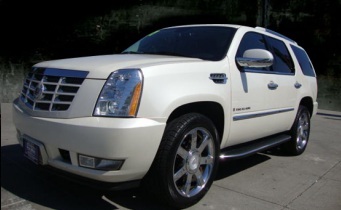 Introducing a brand new Cadillac Escalade ESV to HF Wedding & Hire Cars. Launched by Cadillac for those really big celebrities, athletes and hip hop moguls who have made the Escalade the premier lifestyle choice, the exotic Cadillac ESV is now available as a luxury SUV seating up to 6 passengers. The Escalade has helped Cadillac reposition itself as a brand for the younger generation. It is not surprising that Cadillac Escalade ESV are one of the most popular types of SUV’s. They have big and bold styling with all the modern amenities you would expect in a limousine. Escalade SUV’s really make a statement whether it is for your wedding, hen’s party, school formal, concert, sporting event, special occasion or for a night out on the town with friends. Escalades offer incredible style, comfort, and luxury. They can make a special event extra memorable and are great for photographs. The Escalade ESV features a third row of seating and 22 inches of extra length which means more space for you, it has an impressive 6.2 litre V8 engine and enormous 22 inch seven spoke chrome wheels. The inside comes with LCD screens, DVD, Bose sound system, fully appointed leather interior and wood trim. The Cadillac Escalade ESV is one of, if not, the most luxurious and spacious SUV available today for any occasion. The ESV has a 6.2 litre V8 engine and enormous 22 inch seven spoke chrome wheels. Stylish fully appointed leather interior and wood trim. The Cadillac Escalade ESV is one of, if not, the most luxurious and spacious SUV available today.